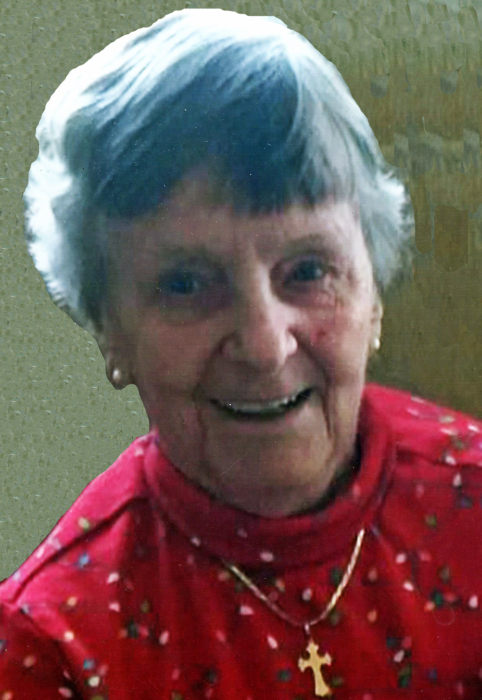 Emily June Schuster (Krueger), age 90 years, of West Bend, formerly of Theresa, Slinger and Madison passed away on Sunday, February 3, 2019 at The Cottages at Cedar Run surrounded by her loving family. Emily was born on June 18, 1928 to the late William C. and Frances B. Krueger (Justman). On May 3, 1947, she married Howard S. Schuster at St. Peter’s Lutheran Church in Theresa. He preceded her in death on November 20, 2005. Emily graduated from Mayville High School, was a loyal Wisconsin Badger fan, and loved to sing hymns. Emily is survived by her three daugthers, Sue (Gary) Janes, Cheryl Wilichowski, and Kay Schuster; four grandchildren, Mitchell (Melissa) Wilichowski, Amanda (Nick) Peters, Griffin Wilichowski, and Spencer Wilichowski; five great-granddaughters, Ramona, Haddie, Harper, Maura and Alexa. Other survivors include her sisters-in-law, Dorothy Krueger, Edna Schuster, and Marion Schuster; as well as other close relatives, many nieces and nephews and friends. In addition to her parents and husband, Emily was preceded in death by three sisters, Sal, Doris, and Annabel; two brothers, Oliver and William Jr.; and son-in-law, Dennis Wilichowski. Interment will be at Union Cemetery in Theresa at 10 AM on Friday, February 15, 2019. A memorial service will be held on Friday, February 15, 2019 at 11 AM at St. Peter’s Lutheran Church (113 E Bonduel St., Theresa, WI 53091). Pastor Darren Knoll will officiate. A luncheon will be held at St. Peter’s Lutheran Church after the service. In lieu of flowers, memorials may be directed to Eastside Lutheran Tuition Assistance Fund, 2310 Independence Lane, Madison, WI 53704. Emily’s family extends their warmest thanks and support to the Hospice Care staff and The Cottages staff of West Bend. The Myrhum Patten Miller & Kietzer Funeral Home of West Bend has been entrusted with Emily’s arrangements. Additional information and guest book may be found at www.myrhum-patten.com.